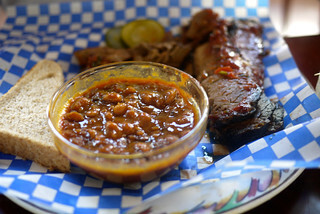 Barbecue for lunch at Hog Shack Cook House in Steveston in Richmond on July 22, 2011. 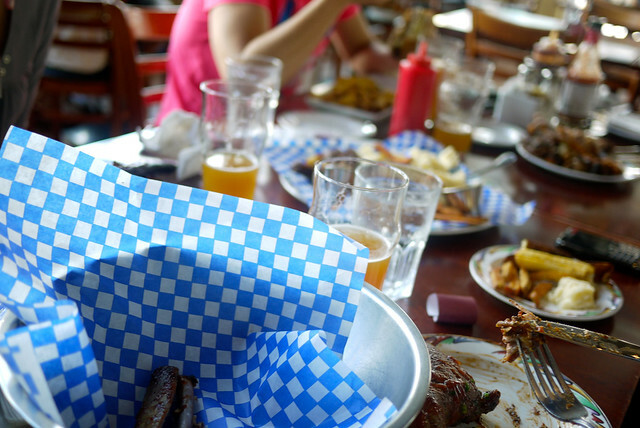 Randomly, a bunch of us off Twitter met up in my neck of the woods to have some good ol' fashioned barbecue amidst the busy Steveston village at lunch time. 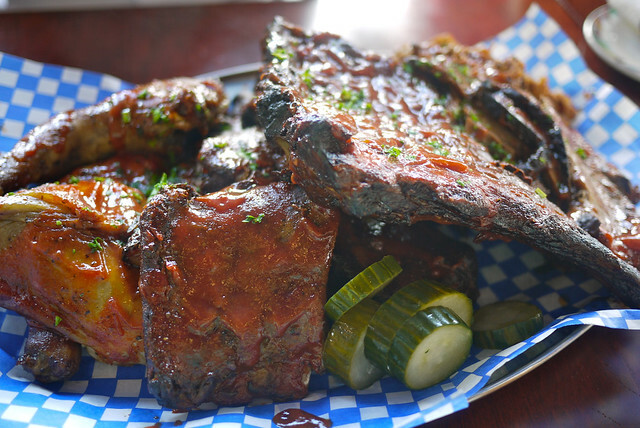 Billed as "Steveston's first and only BBQ and casual cook house", I finally tried their meat and fixings. 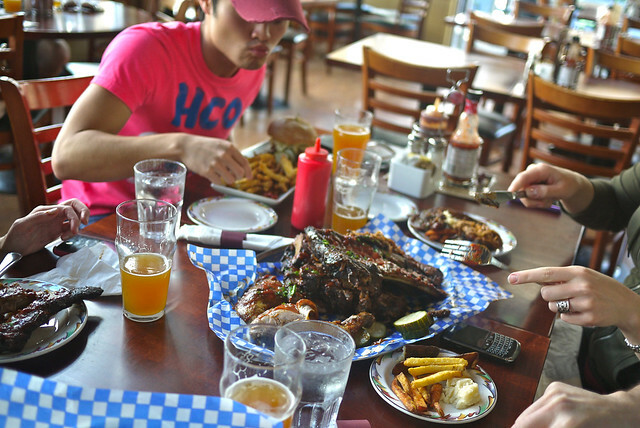 We ordered the four person "Allan's Mammoth Platter" sharing it between five people. With an extra person, we struggled to finish the entire order, but we did. 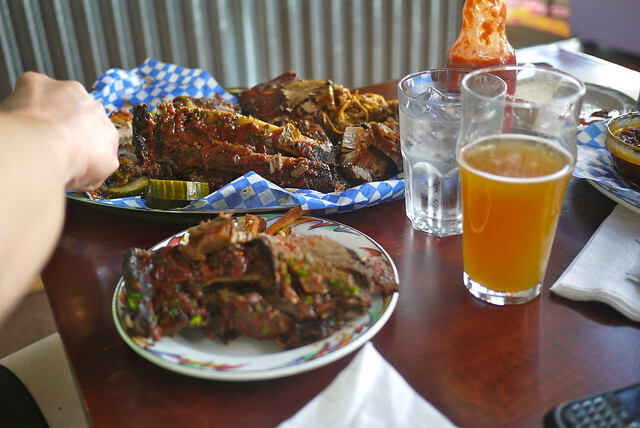 Defiantly, we managed to clean our plates of the baby back ribs, St. Louis side ribs, dino ribs, chicken quarters, pulled pork, and brisket. Not only did we get three kinds of ribs, and assorted other meats, but also six side dishes. 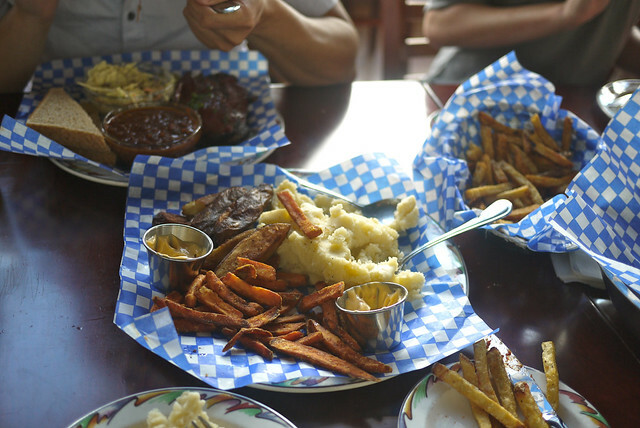 For our six, count 'em six, mammoth side dishes, we went with all potato selections. 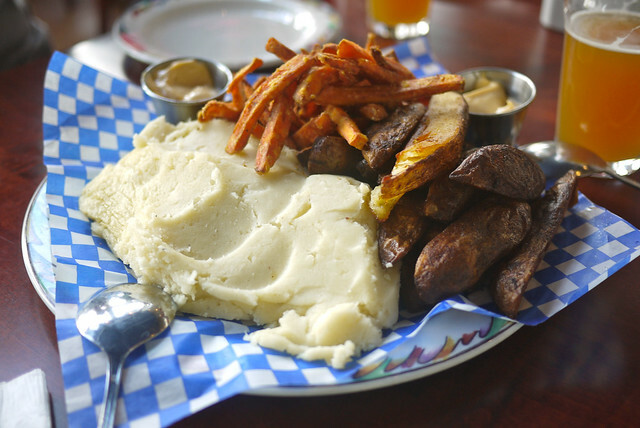 Two servings of hand-cut French fries and yam fries along with potato wedges and mashed potatoes. It was a carb overload. Don't be fooled by the platter description. It says it serves "four and a bit". It's more than enough to comfortably feed six people. Easy, no problem. I thought all the sides were all pretty standard and serviceable. It's hard to screw up the staples. 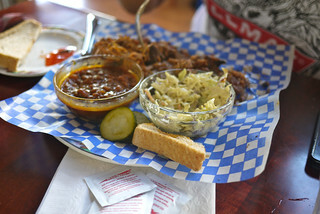 Our non platter friends indulged in brisket and pulled pork varieties of lunch dishes. We were so ridiculously full afterwards. It was a fun, filling time. The staff was nice and friendly. The Steveston location is far off for most, but only a ten minute drive to me. I love Steveston and it's small, friendly, kitschy charm. 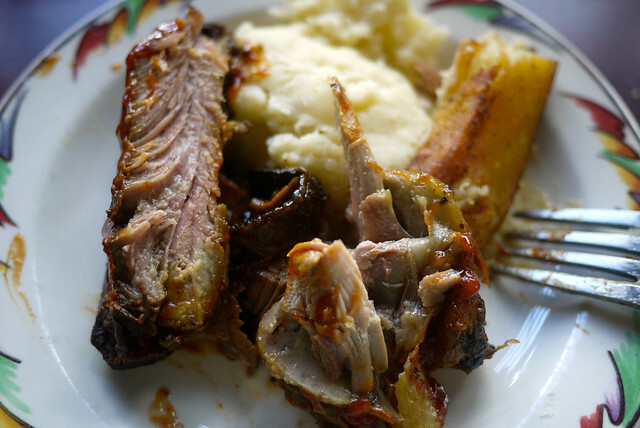 A barbecue joint amongst all the seafood, fish and chip places is a warm welcome. I like the random cucumbers on the mammoth platter.